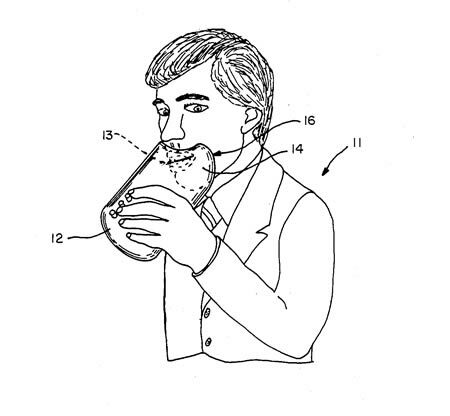 From an anti-eating mask to a bird diaper, here are some of the most useless, weirdest, and absurd patents and inventions of all time. Just in case you happen to forget your period, this underwear will keep you posted. This is how it works: at the front waistband of this feminine undergarment, a clip holding band is equipped by sewing horizontal and vertical threads in a grid form, and below the clip holding band, a date portion is located in which numerals and heart shapes are printed in two lines. Both edges of the clip holding band are designed to be sewn as to extend from the date portion. At first, a gold heart-shaped clip is hooked on the right end portion and a silver heart-shaped clip is hooked on the left end of the clip holding band with a vertical pin and a horizontal pin. Moving the clip onto the clip holding band above the date of the date portion below and allowing the vertical pin tip end to protrude from the clip holding band enables the clip to indicate the date below. This enables the recording of the date when the period began and allows for the computation of the time until the next period begins. 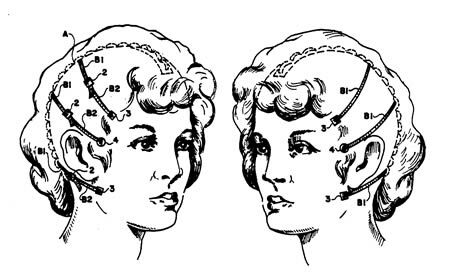 Specially designed for forgetful ladies. Tired of trying to go on a diet and failing every time? The Mouth Cage is the solution for you. 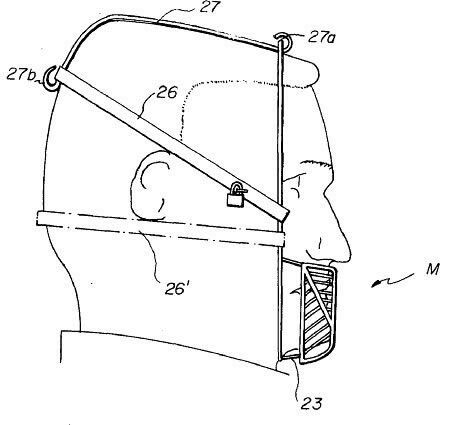 Designed to allow you to breath and speak but not eat due to the food barrier that's mounted on your face, the Mouth Cage is actually locked onto your head, so you can't cheat the system. Quite a subtle way to lose weight. Tired of cleaning your bird's little presents? This "bird diaper" features an enclosed pouch for receiving and containing excrement, and apertures to accommodate both the wings and the tail of the bird. Beat that! Sick of making the bed every day? Well, with this absurd invention, you wouldn't need to. 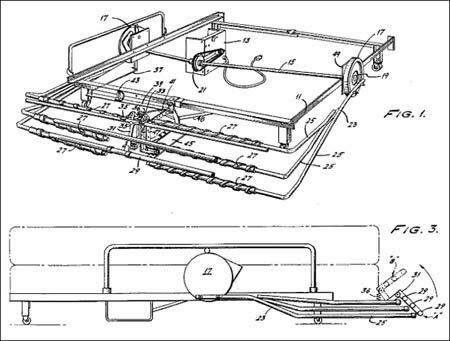 You can use this electrically-operated bed cover making apparatus secured to the frame of a bed and operable to cause a framework carrying a plurality of arms to be lifted from the foot of the bed to the head by utilizing a pair of rotating wheels on either side of the bed frame. If you are looking for a new smoking experience, perhaps what you need is a flavorful cheese filtered cigarette. 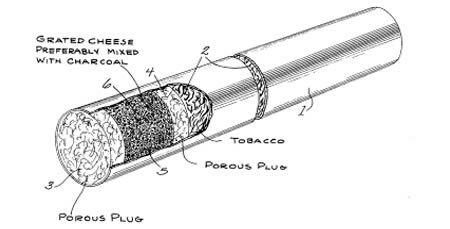 According to its inventor, "current" cigarette filters (circa 1966) don't filter enough tar and nicotine from tobacco smoke, so he "discovered" a new one: cheese! He insists it makes a "very efficient tobacco filter." Many of us, no doubt, have found ourselves kneeling down before the porcelain god, reflecting on the events that brought us there. Usually, these moments result in some sort of vow that our lives will be different if we can just get through the unfortunate experience at hand. For many, however, kneeling is not an option. Often this has nothing to do with irreverence, it is simply a practical concern for the balance and agility needed to navigate our way down to the floor in a highly altered state. For these people we recommend doing their holiday imbibing at public establishments equipped with U.S. patent 6,681,419, a forehead rest strategically installed against a wall above a bathroom commode or urinal or beneath a showerhead. With the help of this absurd invention you'll steady yourself by simply resting your forehead in the appropriately bowing down position required of your shameful state. Strap yourself in and hang on tight… it's going to be a wild ride, you'll get no gentle guidance from a golf pro with this device. 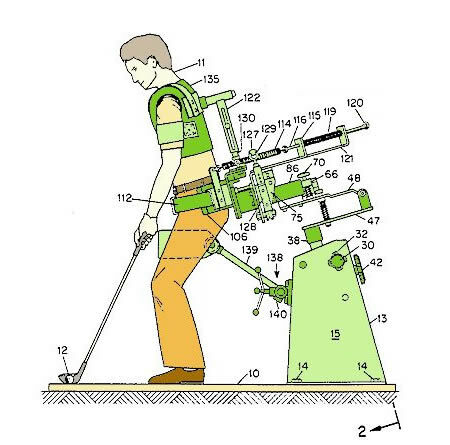 The T3 Bionic Golfer grabs and holds your shoulders, arms, waist, and legs, giving it total control over your girly golf swing. The T3 is designed to help you improve your swing with firm guidance and features a hip gripping padded saddle and a vest with a rigid back plate. So make your move, back up and lock-in to the T3. Now go ahead and try to relax during your swing, we dare you. And that swing better be good, or you may just be locked into this thing until you get it right! Got a hot date but your face features a few flawed folds? Try this sophisticated, do-it-yourself Instant Face Lift. It's easy and "fun" to apply the anchor band # A to your scalp by parting your hair and squeezing on some surgical adhesive. Next, glue tabs 3 and 4 to areas that need a little extra stretch and pull the tensioned straps tight for that home-made lifted look. 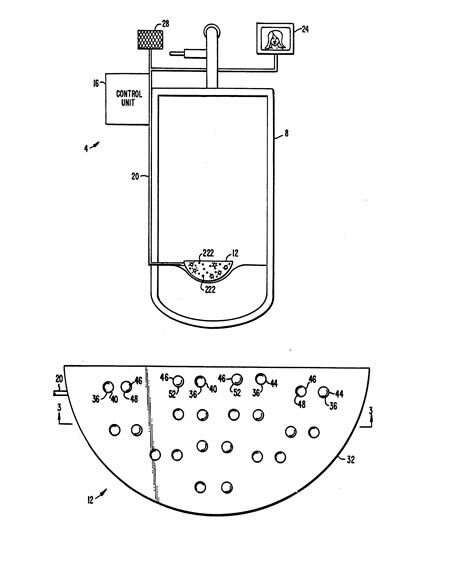 The inventor suggests: "to make the device as inconspicuous as possible, the elements are either completely transparent or flesh color". We are not sure no one will notice that little clear adhesive blob stuck to your face with a strap running into your hair. 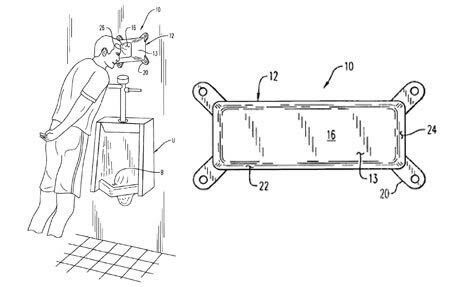 So here's the idea: a urinal with amusement features. Discouraging the inadvertent or intentional diversion of urine outside the proper receptacle, urine is detected by pressure or temperature sensors 12, sending an electrical signal to a control unit 16. This activates a loudspeaker 28 and video screen 24, to provide audio and visual signals. The combination of sight and sound may be varied by the user upon proper direction of the urine stream, and the user is actively involved in his own amusement. Is like Disneyworld for your member. 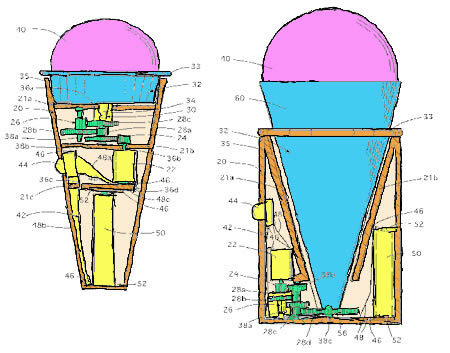 This is a novelty amusement eating receptacle for supporting, rotating and sculpting a portion of ice cream or similarly malleable food while it is being consumed comprising: a hand-held housing, a cup rotatable supported by the hand-held housing and adapted to receive and contain a portion of ice cream or food product of similar consistency, and a drive mechanism in the hand-held housing for imparting rotation upon the cup and rotationally feeding its contents against a person's outstretched tongue. Of course it is impossible to think that someone might be able to just rotate a regular cone as they lick the ice-cream. 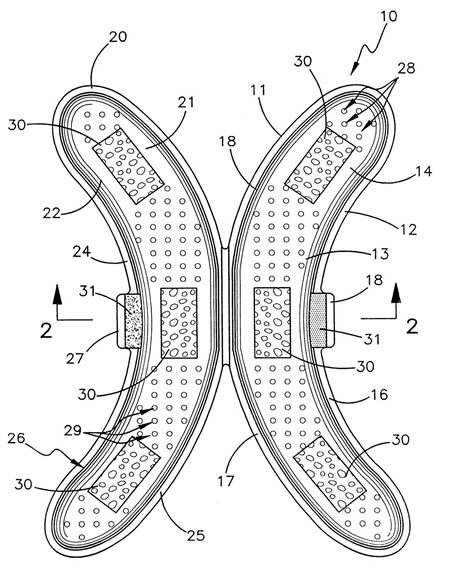 This banana protective device includes a container having a first cover member and a second cover member being hingedly attached to the first cover member and being adapted to store a banana therein; and also includes pad members being securely disposed upon the first and second cover members for protecting and cushioning the banana; and further includes fastening members being attached to the first and second cover members for fastenably closing the first and second cover members together. Meet the "Sound Muffler," a device into which a person may yell or scream without disturbing others, allowing him to vent built-up anger and frustration. The interior of the muffler is coated with foam. A microphone can be included to pick up a some sound and activate a light display or meter giving the user immediate visual feedback as to the intensity of sound produced. We can create emoticons (such as smileys) with keyboards by combining various keys to form a big grin, a sad face, and so on. But what if you had a keyboard system with a different key for every emoticon? This invention includes a keyboard with keys representing emoticons and abbreviations; a keyboard processor that produces enhanced scan codes in order to create the emoticons on your screen; a keyboard driver for interfacing with the keyboard; and an application that receives the emoticons or abbreviations determined by the keyboard driver. So this is an "eating utensil" which, when used, resembles chopsticks, but which does not require the skilled manipulation of them. Instead, the utensil includes a pair of handles and resembling chopsticks that converge toward their distal ends, where they are secured to a food-engaging member, such as fork tines, a spoon, or other Western-style utensil. Or... you can just use the fork and get it over with. 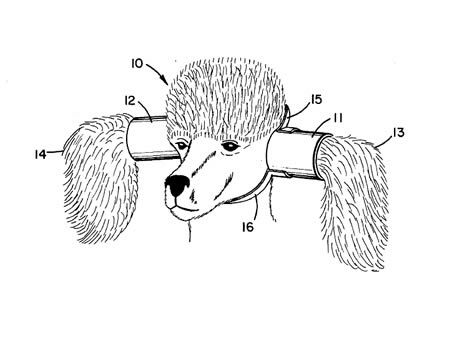 This absurd invention provides a device for protecting the ears of animals, especially long-haired dogs, from becoming soiled by the animal's food while the animal is eating. 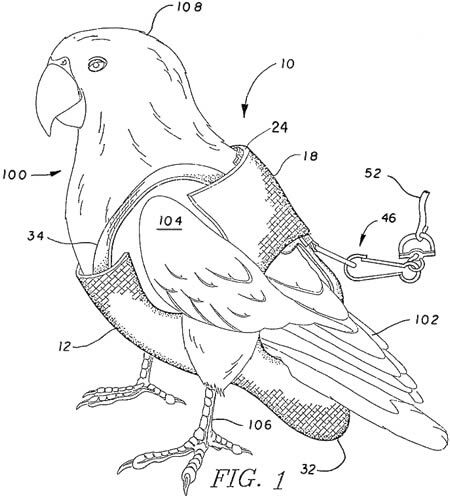 The tubular shaped devices would contain and protect the animal's ears, and another piece to position the tubes and animal's ears away from its mouth and food while it is eating.